She appeared among the other squirrels on my hillside about a month ago, a few weeks after the unexpected loss of my cat, Dickens. The wrinkled, diseased and mostly hairless skin on her little body told me that something was very wrong. Her head was constantly sweeping to the right, as if she was motioning you to look behind her. She would grab a peanut and sit back on her rear legs, shaking back and forth and side to side as she nibbled on the shell. She’d fall over constantly, but would pick herself up and get back to her peanut. I began calling her Shaky. I emailed pictures of her to the wildlife center here in town. The veterinarian said it looked like she had some kind of parasitic condition, probably secondary to whatever else was going on with her. Shaky showed up every day. She was used to seeing me in the yard and would come over for her peanut treats, hopping like a bunny on my hillside. She could go uphill fairly well, but downhill usually resulted in a lot of tumbling until she was stopped by a tree trunk. Still she carried on. She was clearly very sick, but she didn’t care. She seemed to be happy…even joyful. And watching her flooded me with that same joyous feeling. And then Shaky took a turn for the worse. She was mostly blind now, and had become very wary of me. A few days ago, on a hot 95 degree day, I found Shaky chattering on a high tree in the woods across from my home. I knew she needed water, and when it came to water I was the only game in town. With the path cut, I put out water, seeds and peanuts…and waited. Eventually she came down from the treetops and stumbled around until she found a peanut. I cheered for her success…and then I sobbed. The following day I saw a very feeble Shaky for the last time. She found one of the peanuts I threw in her direction and crawled under my fence. I watched her roll down the slope and land near a tall fir tree, still clutching the peanut. By the time I came around to the front she had disappeared. I would have cared for Shaky under any circumstances, but my need to help her was so strong I felt it all the way down to the depths of my soul. I didn’t realize why at first, but now it’s crystal clear to me. I’m a caregiver by nature…that’s just me. I took care of all the angel critters who have left my life over the years – some for weeks, some for much longer. All, that is, except Dickens. I didn’t know until the day I lost him that his body was filled with cancer and our journey had come to an end. There was no time to brush his glossy black fur. No time for one last catnip–filled frenzy on the cat track. No time to hold him in my arms and breathe in his magic, filling myself to overflowing with his magnificent spirit. I didn’t have that time with Dickens…but I did with Shaky. I have to wonder if Dickens sent her to me. Or perhaps Dickens decided to show up on earth as a sickly squirrel so we could have those last precious weeks together that we were denied when he was in feline form. 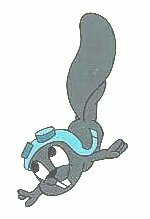 I know that Shaky is gone now, and is soaring through the stars like Rocky the Flying Squirrel. I didn’t need to be there when she left this life. I’d already done that part with Dickens. It was the time before that I had missed. I’m sending a great big heartfelt thank you to one very special angel squirrel…and also to Dickens, her co-conspirator! Chris, if you feel complete, then it probably was so. I’m glad you had some closure! 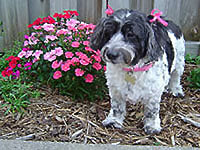 I got on this site today because it is 2 years and 3 months since I lost my forever dog Samba. I only had her for 4 years & she touched my life so deeply. I have had and still have other animals in my life- all those that have passed on lived a full life span- but she was truly my forever dog and yet I had so little time with her. What added to the pain is I had left to do some work 4000 miles away for a year leaving her in the care of my brother who was just as close to her. After 6 months I even flew home because I missed her and knew it would be 6 more months before I could see her again. Just before I left to the airport I had her in the room with me and talked to her and kissed her the way I always did before I leave-then told her as before: “you better stay safe, this better not be the last time I see you”. Not out of a sense of impending doom but out of the general fear I had of being apart. 2 Months later she got out of the yard and was hit by a car. I flew home immediately and was only able to claim her ashes. There has been a huge hole in my heart ever since. I feel cheated- all of my other pets have been deeply special to me and were able to live long lives- but the one that I was connected to heart and soul left at the beginning of what should have been a long life of adventures. After claiming her ashes & dispersing them at our favorite spot I had to fly back to work. After the plane landed I went to a bookstore and came across “For Every Dog..” and I read it regularly. I always feel a pain when I read the line about forever dogs never being left behind but my deepest hope is that we will be reunited just as in the book. Upon reading this article today it brings to mind that the first animal I lost was a hurt baby squirrel when I was 5. To this day I can recall every single animal that I have ever lost going back to that squirrel- even the random hurt birds that we tried to save and a hurt butterfly I found. They are all remembered with love and sense of peace, but with Samba the hole that healed with the other losses, including human loved ones, seems as big today as it did over two years ago. The only thing that offers some comfort is that her and I spent 3 1/2 years having more adventures and fun than I have done in most of my life. I hope I made her short life as wonderful as she made mine. I’m very sorry for your loss of Samba. How heartbreaking that you were so far away from her – that can only make the pain much harder to handle. I can tell you’re a compassionate person, and you would never leave your forever dog behind. They are by our side in our everyday lives, and in our hearts when we are apart…whether apart for a few hours or apart due to loss. Samba was…and still is…loved deeply. You gave her the greatest gift we can offer to another living being. One day you will be reunited…and the adventure will continue!